Ethan grew up in a family that has always been in the rodeo circuit. There was no question that he was ever going to be anything else… until he’s sidelined by seizures and can no longer ride. Then he meets Brandon and he begins to wonder whether maybe, just maybe, his life isn’t over. I don't often read short stories, but every so often I have a small window to fill and... well, this was the perfect read last night. I read a lot of sports romances, so the hockey references were plenty for me to know exactly where Brandon found himself, and enough cowboy romances that Ethan's position was also evident. Inevitably in such a few pages, the romance has to move forward quickly, but it certainly worked for me, and we are left with expectation rather than a fully formed tale – I do hope that Ms. Hecht considers writing more about this pairing. 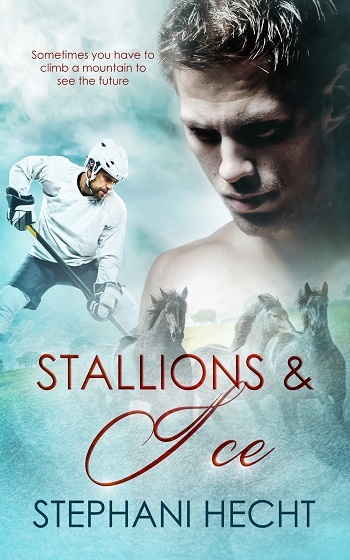 Reviewers on the Wicked Reads Review Team were provided a free copy of Stallions & Ice by Stephani Hecht to read and review.